Thanksgiving is my favorite North American holiday by far. It doesn't make new or poor Americans feel as left out as some of the other festival days. During winter break, why did the fat dude in red bring presents for everybody in my class except me? 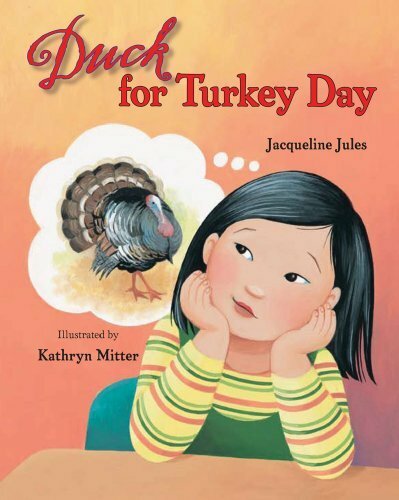 Duck For Turkey Day, a new picture book from Albert Whitman & Co by Jacqueline Jules, illustrated by Kathryn Mitter, tells the story of Tuyet, a Vietnamese-American girl who worries about eating duck on "Turkey Day." 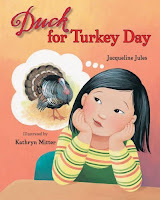 A chorus of classmates reassures Tuyet at the end of the book, describing a diversity of food eaten at their tables as they too celebrated America's day of gratitude with their families. The book is wonderful choice for classrooms and families this Thanksgiving. School Library Journal says, "This sweet tale is written in straightforward prose and provides a brief glimpse of another culture. Mitter's bright illustrations accented with cozy details draw readers into Tuyet's happy home and enhance the story's heartwarming message." I always think it's funny when Indians celebrate Thanksgiving. I mean, sure, the Indians and Pilgrims were best friends during that First Thanksgiving, but a few years later, the Pilgrims were shooting Indians. So I'm never quite sure why we eat turkey like everybody else. "Hey, Dad," I said. "What do Indians have to be so thankful for?" "We should give thanks that they didn't kill all of us." We laughed like crazy. It was a good day. Dad was sober. Mom was getting ready to nap. Grandma was already napping. To find books and resources recommended by Indians about Thanksgiving, visit Oyate, "a Native organization working to see that our lives and histories are portrayed honestly, and so that all people will know our stories belong to us." I've included them below.